The lack of meat this month has brought home to me the importance of diversification. I had always wanted to diversify the farm and had initially planned to sell Free Range eggs, however I found the markets already had a number of egg sellers on board and didn’t want another. Given that we had invested in a Food Safety Plan for meat sales and bought a lot of chiller equipment it was natural to look at other potential animals. I have introduced you earlier to these three characters and little did they know but they had given me an idea, Goat meat. Goat meat, or Chevon, is very low in fat and cholesterol, its tasty and most importantly for me it is a niche product. Following my principles of supporting rare breeds I decided the best meat breeds for us to raise are the Boer and Kiko goats. Having carried out a fair amount of research on the rare breeds website I contacted a guy I knew had bred and sold goats in the past to see if he had anything for sale. A week later Reuben and I planned a trip to the abattoir in Wanganui to drop off three pigs and on the way back we headed to Tokomaru to collect a motley crew of seven random goats, a mix of Boer and Kiko breeds. They were not in great condition at the time and I insisted that he drench them and treat/trim their feet, we loaded them into the trailer (specially modified to ensure they could not jump out) and headed off back to the farm. Knowing that goats are even better escape artists than pigs I had chosen the middle paddock of the farm for their current home. Long term I would like to able to let them graze the hilly and rocky land by the river but initially, to ensure they do not run away, I decided to off load them into a paddock in the middle of the farm which is surrounded but my own land and therefore lessen the risk of them getting onto the neighbours land and ending up on a dinner plate as ‘wild’ goat. Leaving them to exit the trailer in their own time I headed home for lunch. It wasn’t long before I noticed from the window that they had already managed to scale a fence and open a gate so as to be heading to the furthest hill on the property and off into the neighbouring forest. I jumped into Landy and headed off to wrangle the goats and bring them back to the paddock, as I sped through the stream and up the hill a cunning plan struck me. Having shepherded the goats back into the middle paddock I put my plan into action. Using the lure of food I managed to get Emily, Michael and Charlie to follow me into the middle paddock – I intended to introduce them to the new goats and they would act as my disciples, spreading the gospel about the lands of milk and honey on Woody’s farm. Looking a bit unsure about whether or not to leave the trailer. So the goats are on the farm, they are happy and settled. I believe two are pregnant and I have more to buy. Its a small start for our second farming exploit but I hope to be at the markets with Chevon before the end of the year. 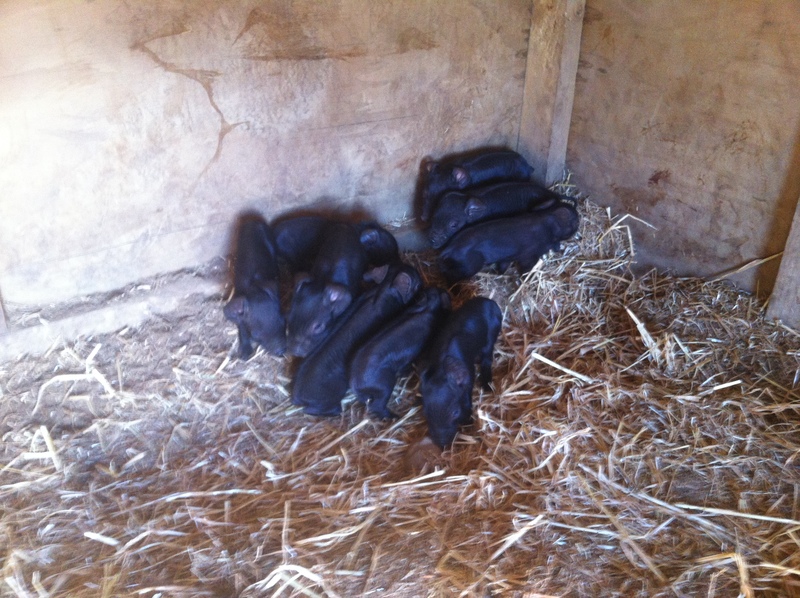 In other news Ruth pulled a fast one on me and managed to drop nine little, perfect, piglets. She had been placed with Hugh on the 3rd May and last week she looked like she was getting close but I suspected the end of September, I was one cycle out. On the morning of the 3rd September I went to feed her to find she was looking tired and was sporting very ‘used’ looking special lady bits. Heading over to the farrowing hut there were nine perfect, tiny piglets. Ruth’s nine little piglets, just hours after being born. The most surprising thing is that this is Ruth’s first litter, she is only 11 months old (was one of the original Wanganui 9 that I bought onto the farm last December), and she had farrowed by herself with no problems and no deaths. In addition a litter of 9 for a first litter is very good. On a final note I realised the other day that I talk a lot about the animals but not so much about the produce. This week we introduced our first Salami to the markets and in just two days I was sold out. Salami Caliente is a hot salami made with 100% free range Woody’s pork I will have more soon and in the meantime here are some photos to make you salivate. Every week on the farm I have a number of work goals to achieve. Of course daily chores like feeding, pumping the water, testing the fences and checking the health of the pigs, all have to be done, but because we are still setting up the farm I also have a large amount of structural and livestock management projects to attend too. This week/month the key goal is to wean the piglets, move the Sows from the rooted up land to grassy paddocks and introduce the gilts to the boars. Starting with Paula and Marigold, the Large Black sows who have clearly had enough of their 17 children, I have fenced off another section of the breeding paddock with four strand electric wire fencing and built another farrowing house. One of the farrowing huts. 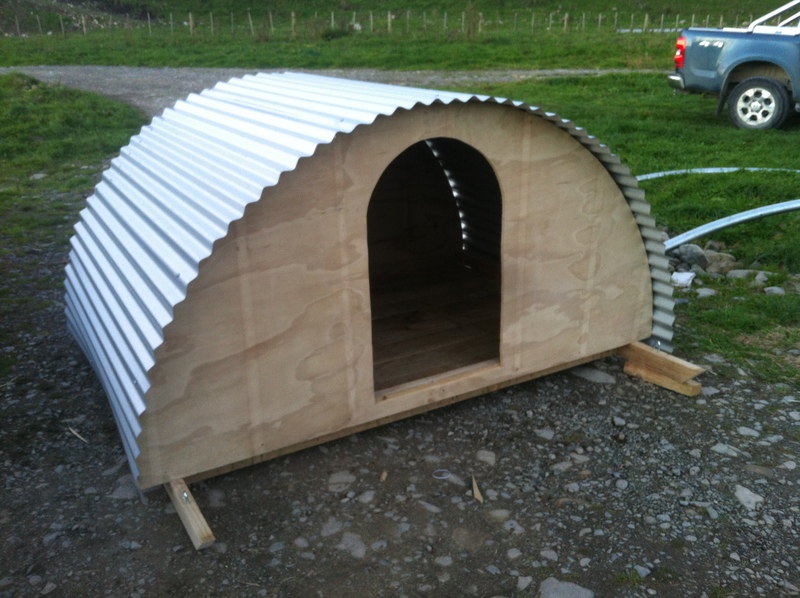 Measures 2.4m x 2.4m, has no floor, it fitted with straw and pallet walls (which provide insulation). Weaning piglets is something that I have not had to do yet so I can only rely on what I have read to find the best way. The Sows (mothers) are being literally drained by the piglets and they need to be moved asap to ensure all the pigs (mother and children) are healthy. The plan is to firstly move the sows into their new paddock and then construct a small pallet feeding ‘room’ that I can feed the piglets in, close the door and lift them into the ute (to transfer them to the grower paddock.) 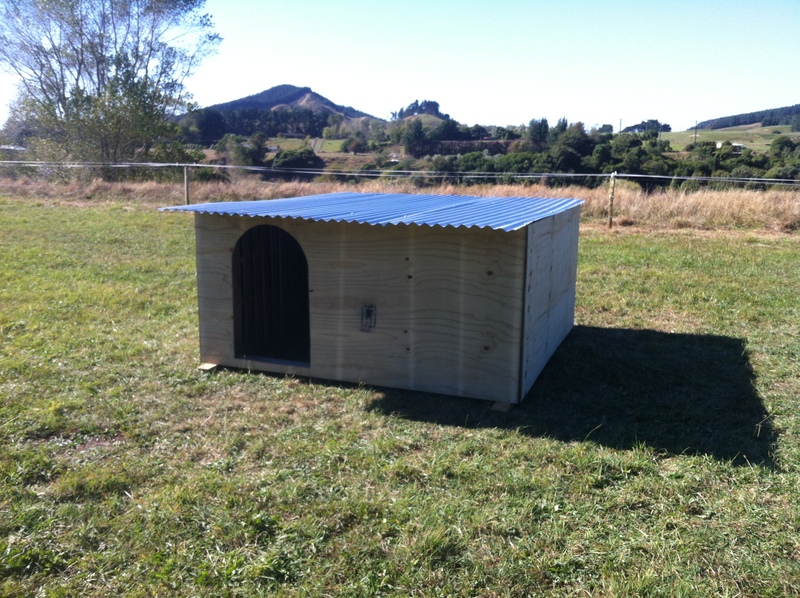 Having set up the paddock for the mothers I then needed to build a new Ark for the piglets in the grower paddock. Followers of my blog from the start will have already seen the Ark’s that I built months ago and by now I am pretty good at building stuff so I set to work. The first job was to buy wood and having found my favourite timber merchant (Rangitikei Timber) I bought over $1000 worth of wood. Then I bought a mitre saw and with the help of a few half pallets and an old kitchen cupboard I built my first workbench. Mounted with my spanking new Black and Decker compound mitre saw. With this in place I enlisted Reuben to help me cut the 4.8m lengths of wood in order to construct Ark3 (so named because it is the third Arc I have built). The Ark took about 4 hours, even with some major modification to the build in order to account for the roofing steel being too short (my fault). Ark3 – the latest addition to pig town. Having completed all the works required for the big move all I need to do now is to move the pigs. Given that this is the hardest part of pig farming I managed to convince myself that I was too busy this week and left if for a another week. That said I will be immensely relieved when all the movements are complete. One of the related issues to the piglets growing up is that they totally destroy the paddock and therefore the ground needs to be rested. Unlike the big ruts that the sows make the piglets just soften the top few cm of soil and in particular they like to dig around the boundary. As they create little waves of soft soil they gradually push it towards the electric fence line and once on the fence it earths and reduces the power of the shock throughout the whole farm. This week I had not got around to walking the perimeter to check for soil on the wire and Thursday afternoon I paid the price for not making sure the electricity was on. As I went around to feed the pigs I noticed Hugh and Ruth (who live in a paddock that has an outer perimeter fence adjoining the DOC forest) were missing, thinking they would be in their hut I slowly made my way to their paddock, they were not in the hut. Panic took over me as I know that any escape outside the farm puts the animals at risk of being hunted (I live in fear of pig hunters thinking they have hit the jackpot and have since installed cameras and signs around the whole farm), I ran into the paddock and the far fence line. I really didn’t have to go far because there, just behind an old 7 wire fence line, was Hugh and Ruth looking me straight in the face (with a sheepish look in their eyes). My heart stopped, how on earth did they get there, how would I convince them to come back and how would they get through the fence! Now, if this was a Stephen King novel or a suspense thriller of some kind then the story is about to get very tense, the reality is a lot less interesting. Ruth spotted the green bucket I was carrying and like a Bambi version of a 100kg pig she launched herself through the fence and bounded towards me, ears flying in the wind. Hugh, a little more aloof, looked at Ruth and realised he was about to miss out on dinner and literally rammed the fence, lifting a section about 5 m long, and bounded over to the bucket. That night I hastily put up a single strand of electric tape around the fence line and went to bed. The next morning they were still in the paddock and I set off to Feilding farmers market knowing that I would be out in the dark that night making sure that electric tape was working, secure and powerful. This week I continued my marketing blitz and general climb up the ladder of fame with an at home interview with the Otaki Mail. Vivienne came round to see me and ask the tough questions, actually they weren’t too tough and she was a lovely lady. We chatted for a bit and then I took her for a tour of the farm. After a few cheesy photos of me with the pigs we returned to the house and the interview was over. I hope to be able to share it with you next blog. This weeks ‘farm school detention’ comes in the form of a very tired piece of driving and all the blame is squarely placed on Fred. Having had a few late night and early morning I realised that I was starting to make a few mistakes. I had accidentally left the water running twice and drained the storage container (which causes a air blockage and silt build up), I was constantly forgetting things on the opposite side of the river and the worst was to come one very chilly morning. As I was feeding the pigs in the breeder paddock, silhouetted by the snow capped Tararua range, I decided to take a short cut through one of the paddocks. The paddock was resting and so with no pigs in residence the gates were open. I had driven through this gate many times and at 2.44m wide it is a little wider than the car, not a problem for a careful driver. But this morning I was not careful, I was tired and as I took the corner too early I heard a terrible scraping noise as the gate post and the car met. Getting out the car, almost in a stupor, I was relieved to see that rather than the paintwork being destroyed all the way down the side of the car I had actually only just cracked, smashed and pulled off the plastic running board. Maybe not the $1000’s worth of damage I initially thought, but still I reckon Fred owes me a couple of hundred bucks. And finally, before I go to bed, I would just like to thank all the customers that I met at Feilding and Hill St (Thorndon) last week. I love seeing the regulars and having a chat but I also like meeting new people and talking about what I do and why. Please keep coming, please keep telling me what you think about our products and most of all please say hello, even if you don’t need any delicious bacon, sausages or pork that week. THANK YOU! Its been another long break in between blogs and the only excuse I have is that by the time I get into the house, fed and watered and ready to relax I find myself too tired to turn on the computer and start to recount all the things that I have or, worse still, have not done. So, in an effort to keep this up to date I thought I would change the format from category based to a weekly diary of events, thoughts and bruises (I seem to hurt myself in some form or another every week.) The problem with making this a weekly diary is that, invariably, I will never do it weekly and when I do it is likely to be either really short or full of stuff that is not worth reading. With that in mind the last week was a bit of a ‘scorcher’ with lots happening on and around the farm. I would like to start with a little bit of personal news off the farm which simply cannot be left out of this blog. On the 18th June (at 3 in the morning) my wonderful wife Claire gave birth to our first son, Frederick (Fred). Fred joined the farm a few days later, after being released from the hospital, and ever since has ensured that every morning I am more and more tired. What Fred doesn’t realise at this stage is that Daddy has a very long memory and the more he keeps me awake the more he will have to get up at 6am and feed the pigs when he grows up, true child labour. So with the arrival of Fred and with Claire being in hospital for a few days I also became a house husband, desperately trying to keep the house looking smart whilst feeding, watering and fencing the pigs. In order for me to tell you about this week I have to start the week before! With Claire still in the hospital I was desperate to stay with her but pigs wait for no man and even more so neither does meat. I had delivered two pigs to the abattoir on Sunday the 15th and with Fred arriving early Wednesday morning I was in a rush to collect the cuts from the butcher on Thursday in order to get it labeled and ready for Feilding Farmers Market on the Friday. Now, I know what you are thinking, surely I should have been with my wife (by now recuperating at home) but meat doesn’t know that and if I didn’t make it too the market I would have to freeze it all before anyone got the chance to buy it fresh. With labels stuck to every part of me and meat neatly stacked I got ready for the market and at 5:30 Friday morning I fed the pigs and set off to Feilding. It was a good day at the market, a little breezy but all the regulars turned up along with some new customers. I like talking to my customers and I like the feel of the farmers market, the friendship and camaraderie so it was a pleasant change from the sterile environment of the hospital. As the market finally came to a close I received a call from Claire saying that the midwife wanted her to go back to hospital for a few more days. With a chiller trailer of meat (some frozen) I had no option but to drive straight past Claire, in Palmerston North hospital, and head back to the farm and the fridges and freezers. After a few trips to and from Palmy hospital Claire and Fred came out again on Monday and so the week began on a high. Amidst the sleepless nights the farm still needed looking after, it is amazing what stops working or becomes an issue if you are off site for just one day, especially when you have 39 piglets intent on piling mud onto the bottom wire of an electric fence. I called up Reuben, who had just got back from collecting a large bin of brewers grain from the Garage Project in Wellington for the pigs, and we set to work on the fencing for the next grower paddock, in order to start weaning the piglets, and another breeding/boar paddock for the return of Jimmy (currently on holiday with a bunch of lady friends). Fencing is physically tough but rewarding and after a day of ramming waratahs by hand we were starting to see the paddocks taking shape. The big breeding paddock, separated into smaller paddocks with electric fence lines. The next day it was time to collect a new lot of meat from the butcher and for the first time we had Berkshire meat on the menu. I have always wanted to be able to give customers the choice of breed for their meat and this was my first chance, the problem was it also meant I had to program the labeller with a whole set of new labels (stating the Berkshire heritage breed on the label). Now, I wont be mentioning names but the labeller I have is the same brand as they have in most supermarkets, the only difference is that they have millions of dollars and teams of people to program the machines, I only have me and a frustrated old PC (the software is not available on MAC). Two long hours later I had 8 new labels programmed and started sticking them on the meat. All our meat states the breed of pig the meat came from. A consumer choice not offered elsewhere. It was now Thursday again and the labelling was done as the sun started to fall. It was time to complete my inventory of all the meat, bacon, sausages and ham in the fridges and freezers. This has to be done at least once a week and is listed by type, location and date. It is a laborious job but one I quite enjoy as I have always been a bit of a fan of an excel spreadsheet. After this comes the preparation for the next farmers market, the following day, coount the float, prepare the stock, wash the table cloth and pack the car. Claire and I agreed that the best course of action was for me to sleep in the spare room (actually Fred’s room but he seems to have taken my spot in the bedroom) so that I could get a good nights sleep before the 5:30 start the next day. I was a great idea, in theory. At midnight the door opened, the light streamed in, and a war weary Claire asked me to help stop Fred from crying. Cradling Fred in my arms we went for a walk, around the coffee table, and then again and again and again…he fell asleep and I went back to bed, the silence was golden. At 2:30 another noise woke me, this time it was Woody reminding me that I had forgotten to let him out and if I didn’t open the door right now he would be leaving presents for me on the lounge rug. So much for a quiet night. At 5:30 the feeding, loading, driving and selling cycle started again. The following day (Saturday 5th) started with my first taste of fame. A few days before I had received an email from Helen Jackson at Radio Live asking if I would like to do an interview on the radio to discuss our pig farm, especially in light of the horrible scenes on the TVNZ Sunday show of intensive pig farms in New Zealand. I welcomed the chance to talk about the merits of free range farming and at 6:20am I was sitting in my office/shop surrounded by the buzzing of fridges and freezers waiting for the call. The interview was enjoyable and as Helen and I talked about the benefits of free range farming practices I watched as 7am got closer and my deadline for leaving to get to Hill Street Market seemed dangerously at risk. The interview finished and at 7:05 I hit the road.